iPad users, including the iPad mini users, always take their tablets alongside wherever they go to have an enjoyment. Taking photos, of course, are always the most favorite part among the iPad users. People will want to transfer photos from iPad to pc for a backup and erase the photos on iPad to free up storage space. 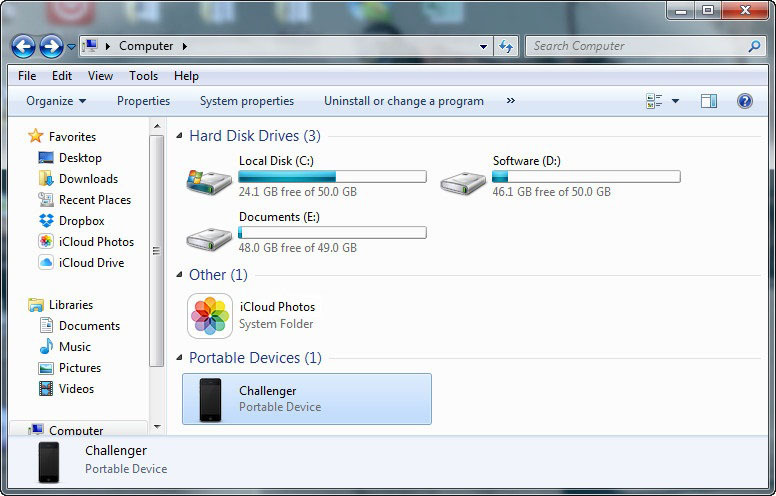 So how to transfer photos from iPad to PC without sync becomes a very hot topic among the users. 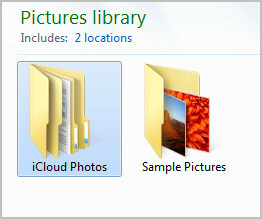 In fact, iPad users have multiple ways to move iPad photos to computer, which will be introduced in the following post. 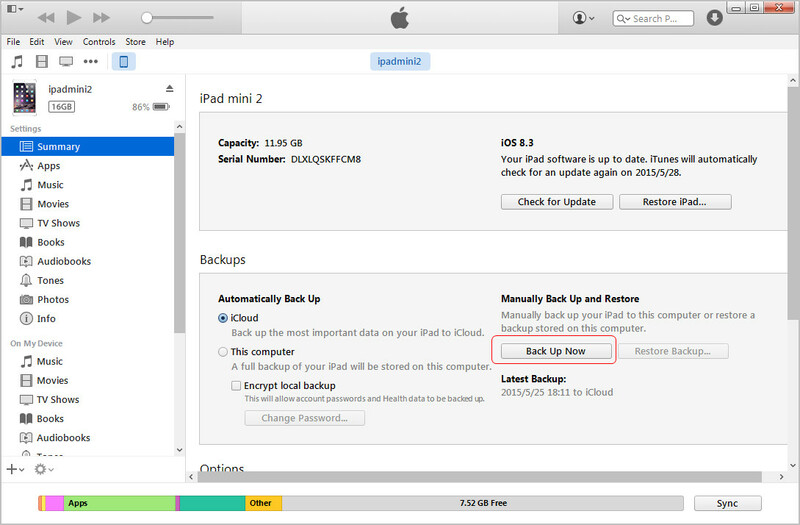 With the iPad USB cable and a computer, people are able to transfer photos from iPad to computer easily, but before moving photos, iPad users should shut down auto sync of iTunes to prevent the data in their tablets. 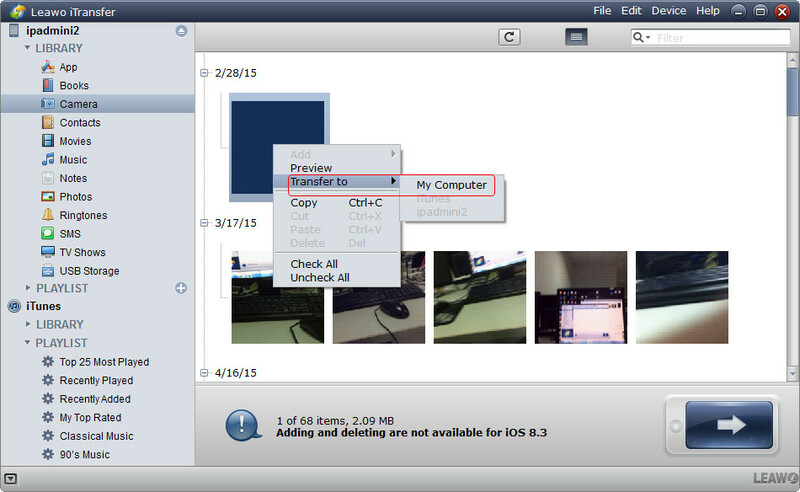 People can use their computer to cut or copy photos from iPad to computer. They will need to connect iPad to computer with the USB cable to finish the job. The tablet will be recognized as a digital camera, and it allows users to view the Camera Roll contents on their computer. So you can transfer photos from iPad to pc for a backup. iTunes isn’t helpful for moving photos from Camera Roll/Moments to computer, but it helps to sync photos to iPad. The photos downloaded from Internet or Email are also saved in Camera Roll/Moments, so users don’t have to worry about the transfer. iPad photos can also be transferred to computer with a piece of iPad transfer software. 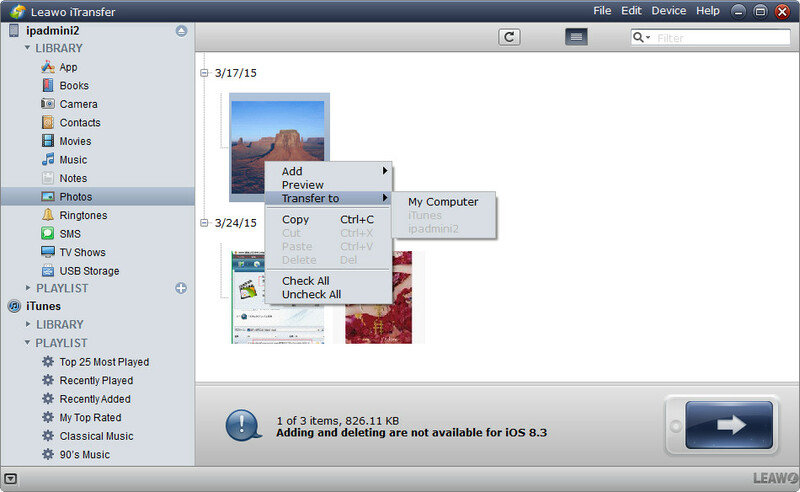 Besides the photos in Camera Roll, the photos and pictures in Photo Library can also be transferred to computer with iPad transfer software. If the iPad users switch to a new computer and want to move the photos from iPad Photo Library to computer, they will need the iPad transfer program. 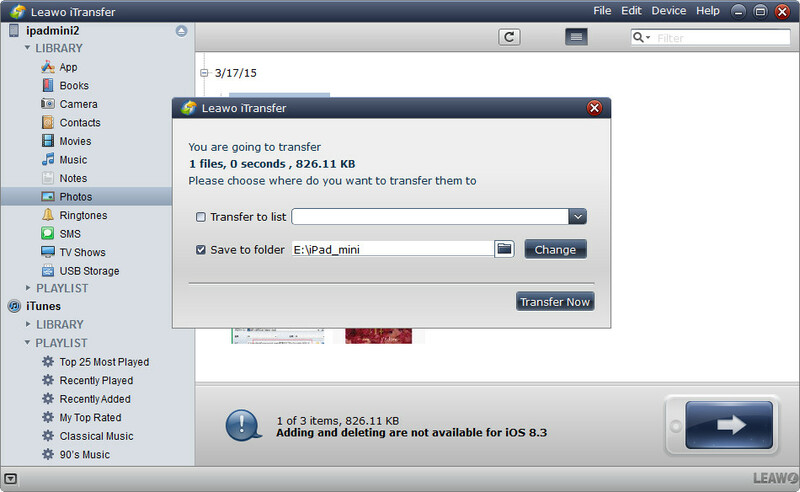 Leawo iTransfer is an easy-to-use and powerful program which provides much help on iPad photo transfer. The following guidance will show you in detail. 1. Launch Leawo iTransfer and connect iPad to computer with USB. 2. Select the photos and transfer. 3. 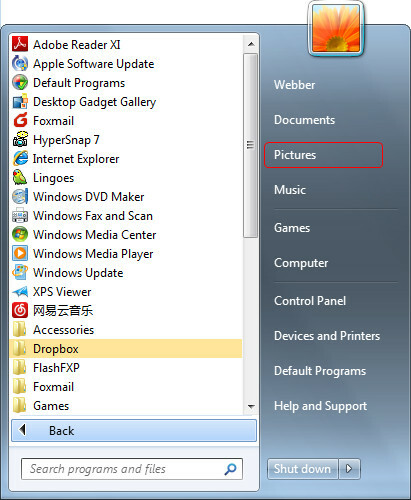 Choose folder in the pop-up dialog to save photos. 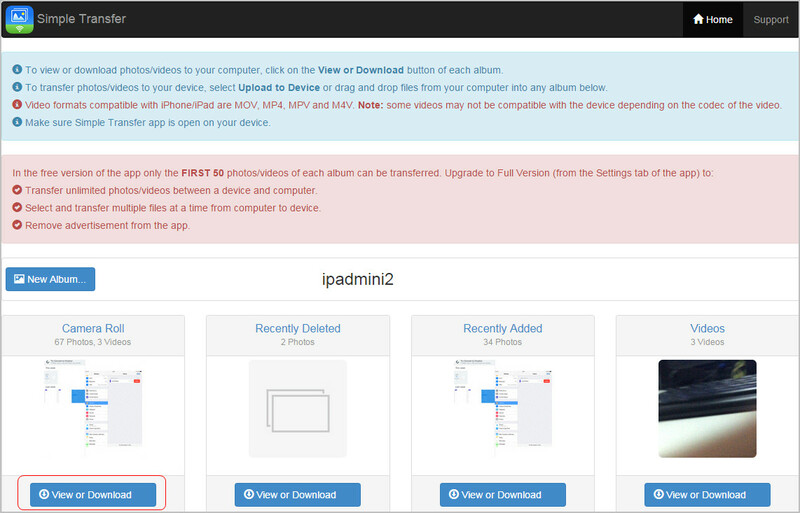 Note that when using Leawo iTransfer to transfer photos from iPad to computer, people shouldn’t disconnect their iPad with computer, or the photo transfer will be dismissed. When people want to transfer photos from iPad to pc wirelessly, they are able to take advantage of the cloud apps and Wi-Fi transfer apps. The following guidance will set Dropbox and Simple Transfer (by Rambax) for iOS as examples, and show how to transfer photos from iPad to pc without USB in detail. 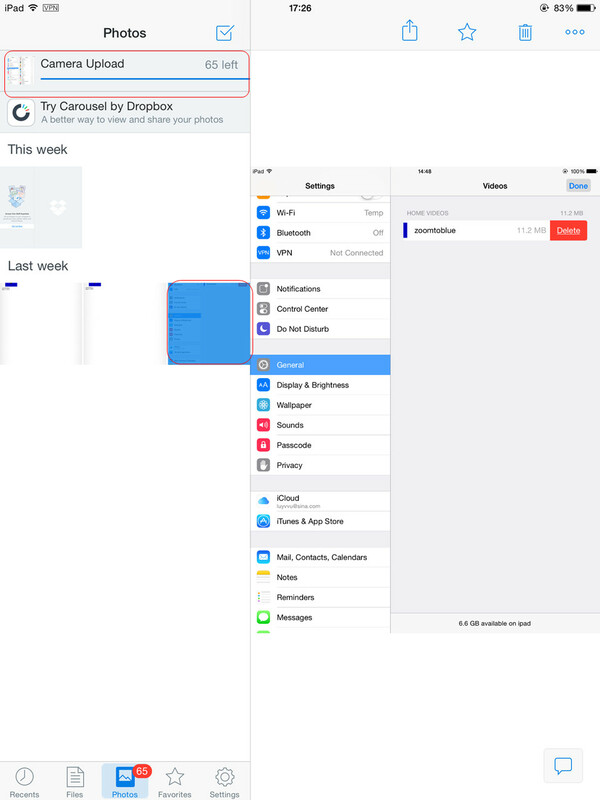 Dropbox is a helpful and easy-to-use cloud app for transferring files between iOS devices and computers. 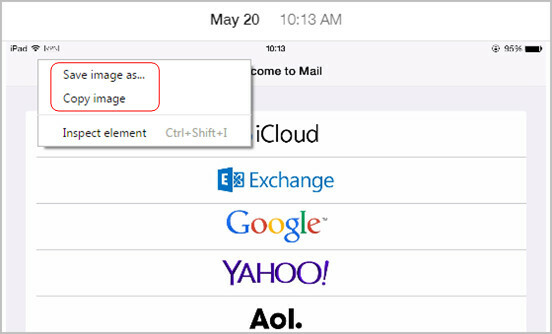 The app provides 2GB free storage space for users, and iPad users make full use of the storage to transfer photos. 1. 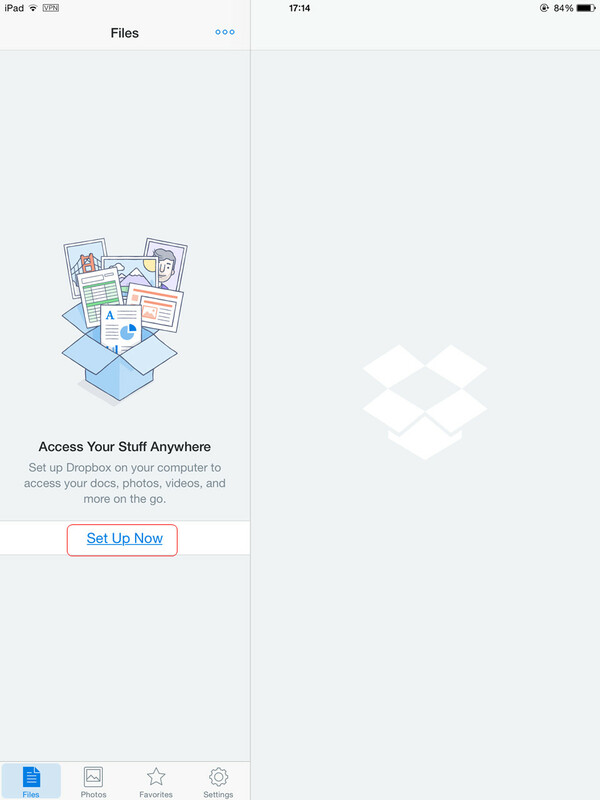 Install and set up Dropbox on iPad. Follow its tutorial to get Dropbox on PC. 2. Wait for the photos to be uploaded to Dropbox. It will take a while if users have thousands of photos in iPad. 3. 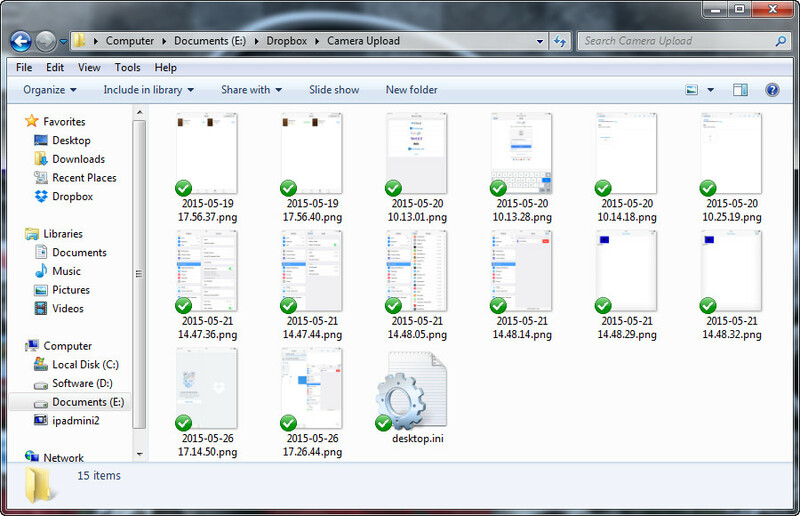 Users will get the uploaded photos in Dropbox folder on PC, and they are able to copy them to another folder. 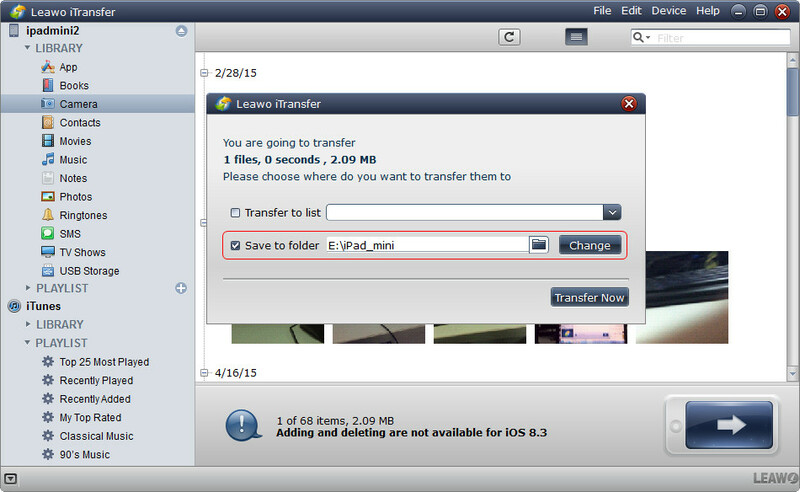 Transferring photos with the help of Simple Transfer is also a good choice to transfer photos from iPad to pc. The only requirement of using this app is that users have to connect to Wi-Fi connection. 1. Install Simple Transfer on iPad. Start it and you’ll see an IP address in the main interface. 2. Enter the IP address in the web browser on your computer and hit View or Download below the albums. Photo Stream of iCloud is also a way to share photos between iPad and computer. 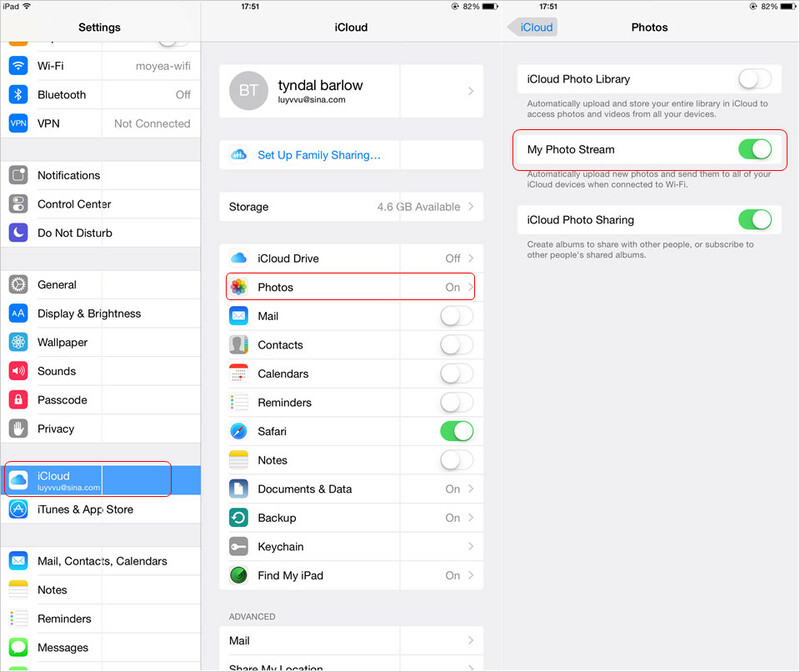 iPad users can enable Photo Stream in iCloud on their tablet, and then every time they shoot pictures, the photos will be uploaded to the cloud. The cloud service will save photos shot in recent 30 days, and then the photos will be erased. Of course, iPad users can download the photos from iCloud to computer, but they’ll need to install iCloud Control Panel at first. 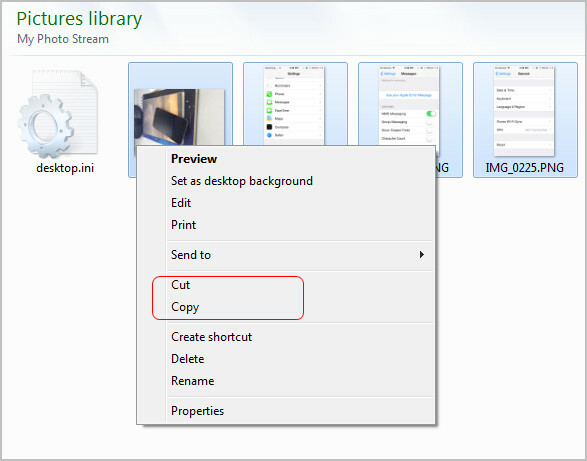 The following guidance will show how to get photos from Photo Stream to Computer in detail. 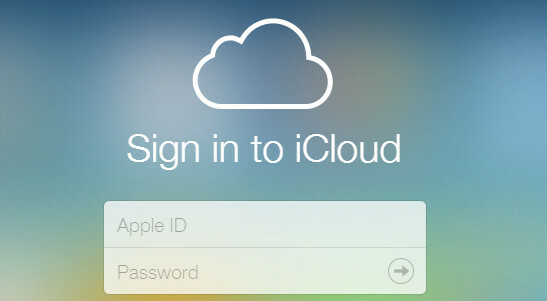 After iOS 8.1, Apple gives users a new way to save photos – iCloud Photo Library. The service is also based on iCloud, which is kind like iCloud Photo Stream, but it’ll keep the photos in the cloud and won’t erase the photos. 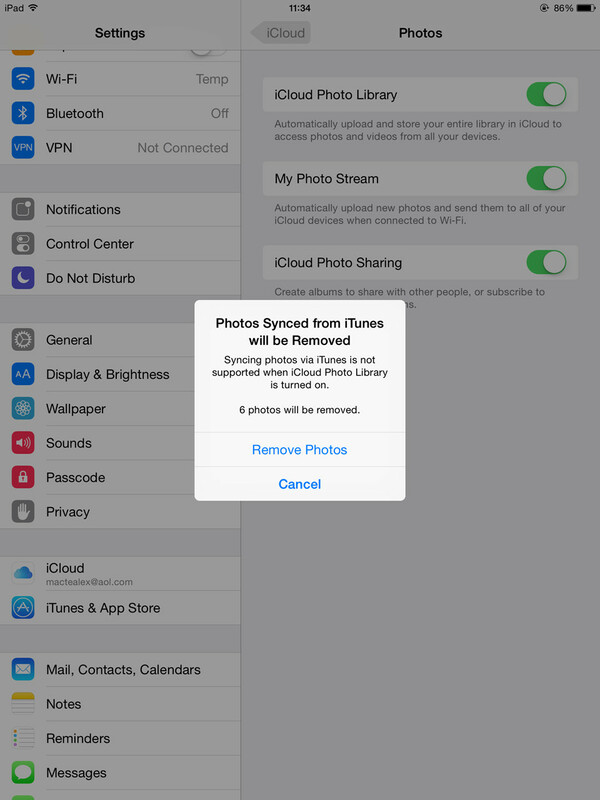 iCloud Photo Library requires iOS 8.3 or later, OS X Yosemite 10.10.3 or later. 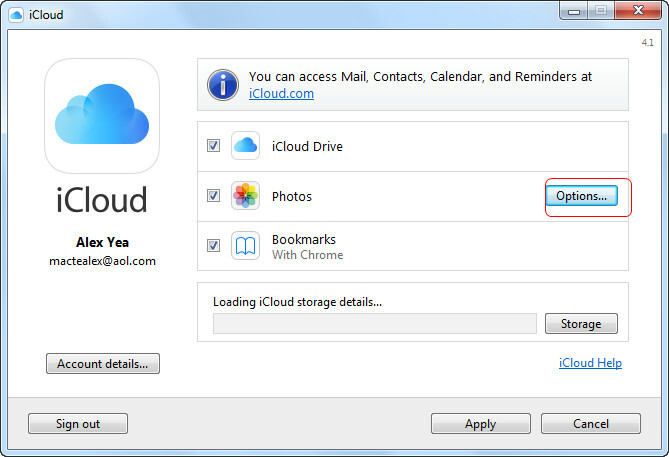 The following guidance will show how to use iCloud Photo Library in detail. 1. 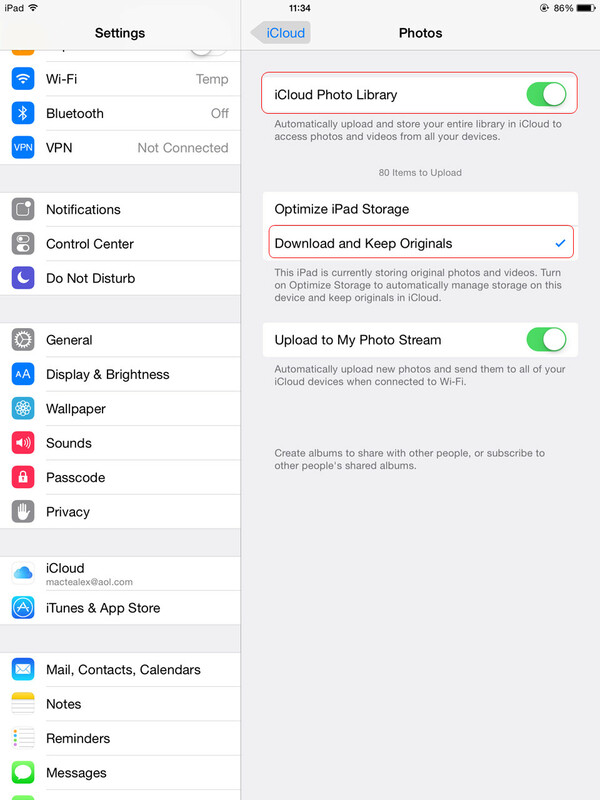 On iOS 8.3 or later, go to Settings > iCloud Photos. 2. The photos will be uploaded when the device connects to Wi-Fi and your battery is charged. 3. Go to iCloud.com, enter your Apple ID, and choose Photos. 4. Locate the photos you need, and download the photos to computer. The photos in iPad Photo Library are the photos synced from computer. These photos on iPad cannot be deleted or transferred back to computer with iTunes. When users want to transfer these photos from iPad to computer, they will use iPad transfer software or other apps. Note that when iCloud Photo Library is enabled, the photos synced from computer will be erased. iPad users may have taken advantage of the photo editing apps to on iPad to make up their photos, the photos are still saved in Camera Roll, but the effects only stay on iPad, and won’t be transferred to computer along with the photos. 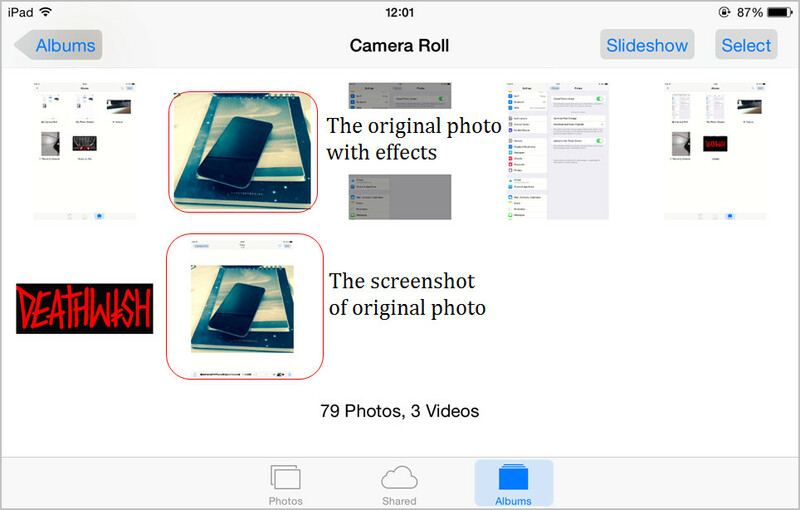 At this moment, users can take a screenshot of the photo, and then transfer the screenshot to computer so that they can get the photos with effects on computer. Another method to transfer photos from iPad to computer is to backup iPad with iTunes on computer. This method may take a while, and the size of the backup will be large. But this method enables users to keep their data safe. The photos and other iPad data are saved in a database in computer, but the users won’t be able to view the contents.